This is Steven Salzberg's blog on genomics, pseudoscience, medical breakthroughs, higher education, and other topics, including skepticism about unscientific medical practices. Here's where I can say what I really think about abuses and distortions of science, wherever I see them. I’m a big fan of the show House, which ran on the Fox TV network for 8 years and is now on Netflix. Gregory House, masterfully played by actor Hugh Laurie, is an brilliant doctor who diagnoses patients whose bewildering symptoms have stymied other doctors. He’s also unbelievably rude: he insults and harrasses his patients and his fellow doctors alike, but they tolerate him - usually - because he’s almost always right. You can find Medicare's hospital survey online. 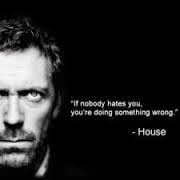 Dr. House would fail, big time. Over at The Daily Beast last week, Daniela Drake summarized this trend as “You can’t Yelp your doctor.” (Not that Yelp isn’t useful for finding a good pizza place.) And yet, as Scott Hensley reported on the NPR blog Shots, online ratings of doctors are becoming very popular, even though they don’t measure how good a doctor is at diagnosing and treating illness. This study has implications for so-called “alternative medicine” as well. Patients who frequent alternative providers such as acupuncturists, homeopaths, and naturopaths often report high levels of satisfaction, as if satisfaction correlated with better care. Now we have a large study showing that this is simply not the case. It makes sense that patient satisfaction is related to cost: patients often demand treatments that they don’t need, and “Patient requests have also been shown to have a powerful influence on physician prescribing behavior”, as Fenton and colleagues reported. It is less clear why the most satisfied patients died at higher rates. Obviously, doctors don’t need to act like Dr. House to be effective. But doctors need to be able to tell patients things they don’t want to hear. Just because you want an antibiotic for your sore throat or your child’s ear ache doesn’t mean you should get one. The UC Davis study demonstrates that using patient satisfaction surveys to adjust reimbursement rates, as Medicare is currently doing, is a recipe for higher costs and lower quality of care. Given a choice between a friendly doctor who gives me what I want and a brilliant doctor who gives me what I need, I’ll take Dr. House. "A large survey covering 52,000 patients, published by a team led by Joshua Fenton at the University of California-Davis found that the most satisfied patients not only spent about 9% more than average, but had a 26% higher death rate. - " " For patients who think a nice doctor is a good doctor, this might come as very disappointing news. -" I see a huge problem in the second statement as it relates to the first since "patient satisfaction" might not be a straight measure of being a "nice doctor." I have filled a couple of these surveys and I do not remember being asked about rating how nice my doctor was. I think this is clearly two different things, and as far as I can predict doctor House's patients always seem satisfied at the end of show. Steven Salzberg is a professor at Johns Hopkins School of Medicine. My short talk on the 2001 anthrax attacks, presented in November 2015 at HHMI headquarters in Chevy Chase, Maryland. The Alternative Medicine Racket: How the Feds Fund Quacks, a video produced by Reason.tv featuring interviews with me and others.